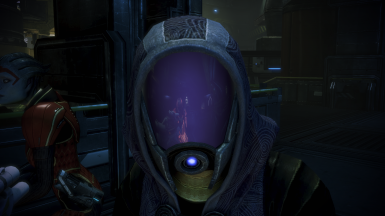 Tali's visor will now have real-time reflections. It's pretty cool. This will hurt your framerate a bit when Tali is around, but it's not a huge hit. As long as your computer isn't really old you should be fine, and if not, just delete the mod. This only applies to Tali's normal appearance and her alternate appearance, in both combat and non-combat. It does not apply to the alternate appearance added by From Ashes, but that one has very little visor showing so it wouldn't really be noticeable anyway. If you have a DLC mod that adds another Tali appearance, it will not apply to that appearance. Big thanks to Giftfish﻿ for recording this video. Copy the DLC_MOD_Tali_Reflections folder to your Mass Effect 3\BIOGame\DLC folder. That's it! Delete the DLC_MOD_Tali_Reflections folder from your Mass Effect 3\BIOGame\DLC folder. This is completely safe and will not corrupt your save or anything like that. This is incompatible with the Tali Full Face Mod, as they edit the exact same files. It is compatible with the Tali Romance Mod﻿, and everything else as far as I know.